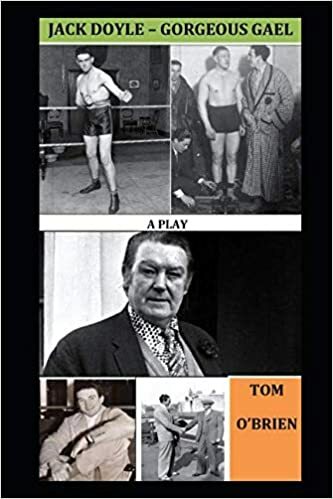 JACK DOYLE – GORGEOUS GAEL looks at the life and times of Jack Doyle, the legendary Irish boxer and celebrity of the ‘thirties and ‘forties. Known as “The Gorgeous Gael”, Doyle was a larger than life figure who earned enormous sums both as a boxer and entertainer. By the time he was thirty, he had earned and spent more than a quarter-of-a-million pounds – an enormous sum in the nineteen-thirties. When he died in 1978 he was penniless and shoeless. Asked once what his downfall was, he replied “fast women and slow horses”.He was an alcoholic, had been in prison, was a wife-beater, mixed with the high and low in society. In this respect there were parallels with Brendan Behan’s life. Indeed, the two were acquainted, having a shared knowledge of Dublin low life when they were down on their luck.This acquaintance is used to bring them together in an ante-room to purgatory. The result is an “examination” of Doyle’s life- as seen through the eyes of many of the famous people he mixed with – with particular emphasis on the women that shaped his destiny.To a lesser extent, Behan’s life is also explored – although the story is essentially Jack’s. Both were larger than life characters. Both pressed the self-destruct button.